Home Actors Leslie David Baker Wife, Height, Weight, Bio, Is He Gay? Not very often do you find an actor or actress with Master’s degree in Hollywood, much less in Human Services, but that is just one of the many things that are unique about Leslie David Baker. The man who will forever be known as Stanley Hudson from the hit comedy show, The Office also has a Bachelor’s degree in Psychology. Baker is a lesson in pursuing your dreams, even when you have a comfortable life. To learn more about Television’s funny man, read below. His education history is the tip of the iceberg when it comes to the strangeness of Leslie David Baker in the world that is Hollywood. Leslie is an incredibly private individual. There is no information about his childhood or family. All we know are the basic facts – He was born on February 19, 1958, and it happened in Chicago, Illinois. The power of deduction, however, makes us believe that Leslie was not only born in Chicago, but he was also raised there too. We believe so because of the strong attachment that appears in his known history, having his Bachelors and Masters education in institutions in the city. As far as we know, Leslie’s formal education started and ended in Chicago. Although he always had a dream to be an actor, Leslie edged his bet, choosing to pursue an alternative career to fall back on should his pursuit of acting fail to materialize. He earned a degree in psychology from the Loyola University in Chicago and a Masters degree at the Spertus Institute for Jewish Learning and Leadership, also in Chicago. After raking in the certificates, Leslie settled into life as an office worker or perhaps a life’s twisted way of preparing him for the role that would change and define his life. Baker spent his early years teaching special education in Chicago. His administration and office worker phase of his life included working for the Department of Public Health, Board of Education and the Office of Cable and Communications. He did, however, get a chance to express his acting talents in TV commercial gigs he booked while he earned his Master’s degree. Coincidentally, he played an office worker in those commercials. After years of sitting behind a desk, clocking in from 9-5, Leslie Baker decided to make a move on his dream to be an actor. He relocated from Chicago to Los Angeles in the late 90s. The move to Los Angeles transformed Leslie David Baker’s life from another average office paper pusher into an American icon. After making guest appearances in a variety of television shows like Malcolm in the Middle, Judging Amy, That 70’s Show and Scrubs in a professional acting career at started when he was 40 years of age in 1998, He booked the role of a lifetime – Stanley Hudson. On The Office, Leslie played Stanley Hudson, a sales representative. The role the first part of his life had been preparing him for. 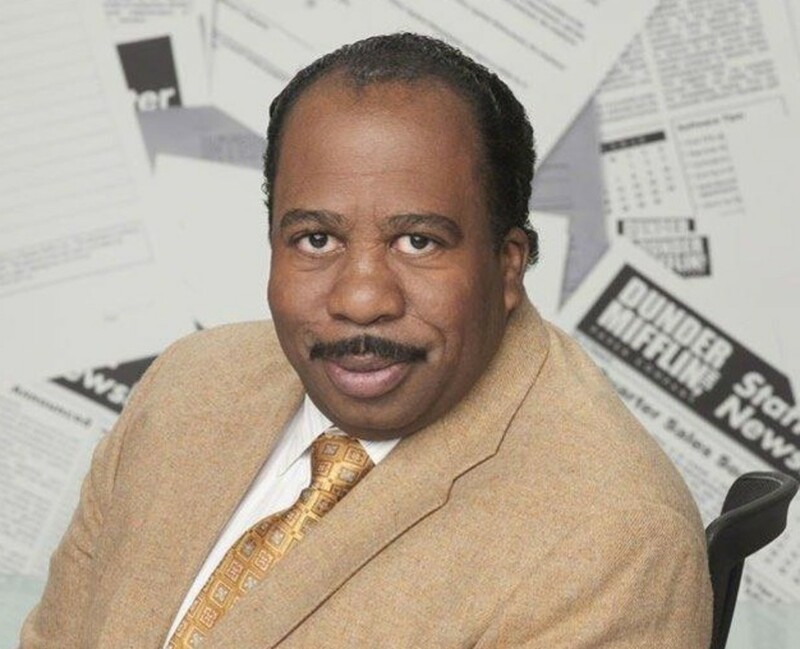 An iconic and successful show, Leslie’s portrayal of Stanley Hudson became one of the defining and iconic identity of the show. He, along with other cast members won two Screen Actors Guild Awards for Outstanding Performance by an Ensemble in a Comedy Series for their performances. Though he will always be known as Stanley Hudson, Leslie hasn’t allowed the stuck identity to keep him from going after other acting roles. He has appeared in other television works such as Still the King, Marry Me, Key & Peele, Raven’s Home, Puppy Dog Pals and a few more. Since his television debut till date, Leslie has appeared on 25 television shows. His feature film resume, however, doesn’t possess a similar number of projects. He has appeared in just seven films till date, since making his feature film debut in 2001 in Road to Redemption. His most notable film project has been Captain Underpants: The First Epic Movie and the most recent, The Happytime Murders. Leslie decision to quit his office work was a decision to pursue every dream and interest he had. One of them is music and Leslie has ticked his own share of the box in that regard. He released a single in 2011, titled 2 Be Simple. The single, which was well received was accompanied by a music video that was famously reviewed by The Washington Post as “For reasons that remain unclear, Baker has released a track destined to be the party anthem at all your yuletide throwdowns”. Personal Life – Wife, Is He gay? One of the strangest things about Leslie David Baker in Hollywood is the identity of his wife. Leslie has refrained from sharing his personal life with the press. He hasn’t so much as mentioned his wife’s name. The lack of public information about his personal life has led to rumors that he might be gay. However, a look through his red carpet appearances shows constant appearance with a woman who is likely his wife or a really supportive friend or sister. Leslie Baker is 5 feet and 10 inches tall. As for his weight, that is unknown but he’s known to be a chubby, potbellied man, a body figure that has played into his characters on film and television.